As we approach the New Year, do you have a bold adventure on your bucket list for 2015? I certainly do. 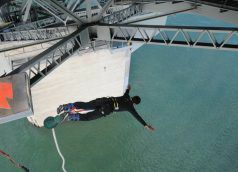 This year, I bungee jumped in Auckland, New Zealand (see picture). I also conquered kayaking Kauai’s Na Pali Coast twice, once against the current and strong winds. For 2015, I will be in Bali,.